Like many Americans, I hope most Americans, I follow the national debate about the Affordable Care Act (better known as Obamacare). Readers with a longish memory may recall I took the time to read the original, infamous 1,018 page health care bill when it seemed like no one was going to bother. This is why when I got word of a new documentary being released I wanted to make sure to share it with you. During the U.S. debate about healthcare reform, the media—reporters and news crews and filmmakers— failed to put a human face on what it means to not have access to healthcare. “Remote Area Medical” fills that gap—it is a film about people, not policy. Focusing on a single three-day clinic held in the Bristol Motor Speedway in Tennessee, “Remote Area Medical” affords us an insider’s perspective on the ebb and flow of the event—from the tense 3:30 a.m. ticket distribution that determines who gets seen to the routine check-ups that take dramatic turns for the worse, to the risky means to which some patients resort for pain relief. We meet a doctor who also drives an 18-wheeler, a denture maker who moonlights as a jeweler, and the organization’s founder, Stan Brock, who first imagined Remote Area Medical while living as a cowboy in the Amazon rainforest, hundreds of miles from the nearest doctor. But it is the extraordinary stories of the patients, desperate for medical attention, that create a lasting impression about the state of modern health care in America. Born in Lancashire, England, Stan Brock is perhaps best known for his years as the co-host of NBC’s “Mutual of Omaha’s Wild Kingdom” from 1963-1971. In 1985 Stan Brock founded Remote Area Medical (RAM). Since then RAM has mobilized over 80,000 volunteers and healthcare professionals to deliver over $75,000,000 worth of free quality medical procedures and services. He has addressed The United States Congress on the needs of providing free quality healthcare to those who cannot afford it nor have direct access to it. Stan has received numerous accolades for his work with Remote Area Medical, including the prestigious Inamori Ethics Prize for humanitarian leaders in 2010 and CNN’s Hero Award in 2012. I can tell just from the trailer I’m going to need a tissue or two to get through this one, but I’m so totally going to watch it. 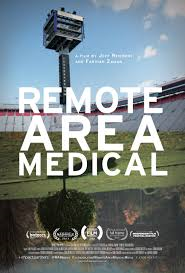 “Remote Area Medical” opens in New York on November 28, 2014 and nationwide on December 5, 2014.